There’s only a month left until release, and we are fixing up a lot of the loose ends and preparing for launch. For this week, we have a lot of updates to share! Major UI Overhaul - the old UI was more a placeholder than a final asset, so we’ve finally updated the UI! It’s now smaller and takes up less screen space too - so you can see more of the pretty backgrounds! Added Choice Indicator - there is now a cool effect (visible in the above video) for big choices, that will let you know that your choice had a major impact on the story. Demo Update - We updated the Demo (chapter 1) with the new UI and choice indicator, along with some edits and improvements. The Steam version has also been updated for Beta backers. New Music Tracks - Chase, our composer, has been hard at work creating the last few tracks of music for the game! You can hear one of the new tracks in the above video. Chapter 7 Edits - Even with all this going on, we have been continuing to edit and work on the last book of the game, and have written nearly all of the missing scenes from Chapter 7 now. 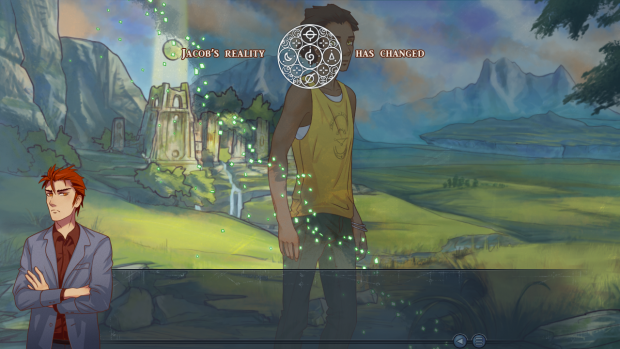 The choice indicator that lets you know which choices have a major impact on the story. We still have a lot to do between now and April 18th, but we’re moving as fast as we can to release on time. We plan to give more frequent updates as we move closer and closer to the finish line!